Let’s say you’ve decided that a million dollars is your retirement savings goal. Is it an obtainable goal for you at this stage in your life? Read on to find how much you need to save each month to hit the million-dollar target based on the number of years you have to save. Of course, the most important thing to do is save. And begin saving as early as possible, allowing the power of compounding interest to work for you. How you invest your savings also has a significant impact on if and when you can meet your savings goal. Determine your investment strategy considering the rate of return you need along with your tolerance for risk. To get even further ahead in your savings, be sure to maximize available employer contribution matches. These employer matches act as a bonus, making it easier to meet your goal. In reality, for some of us, the million-dollar goal may simply be out of reach. Maybe you started saving too late in life, or maybe unforeseen emergencies hindered your ability to save as much as you would have liked. 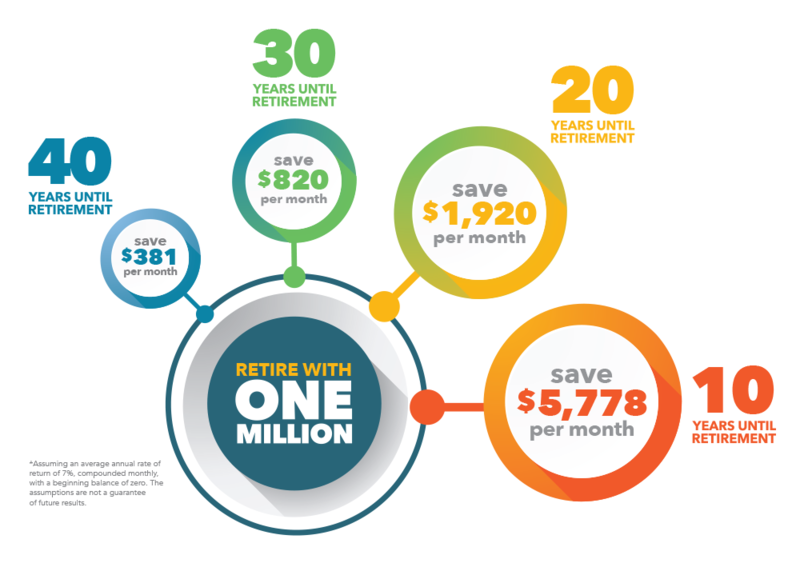 As an example, if you are 55 years old with little to no retirement savings, you would need to save nearly $6,000 a month based on the assumptions used above to reach the millionaire goal. You may decide that postponing retirement a few years will provide the additional financial security needed, or you may need to readjust your plans for your estimated retirement expenses. Whatever you do, keep saving. Keep the power of compounding interest on your side. Save more aggressively by reducing current expenses wherever possible to increase your contributions. And for those of us with children or grandchildren, share this article with them. Talk with them about the importance of starting to save early to make it easier to hit their retirement savings goal. Teach them the lessons you wish you would have learned when you were their age. And remember, there’s no one-size-fits-all retirement plan, click here to estimate what you may need to save for retirement. With careful planning and self-restraint, you can experience a financially stable retirement, whether or not you hit millionaire status. Click here to read The Million Dollar Retirement Standard.